Image: “One and Other-Mental Health” by Feggy Art is licensed under CC BY-NC-ND 2.0. Over break, I happened to be scrolling through my Facebook feed and came across a post about a family in a situation where a mother and child were financially stuck in an abusive situation with her ‘bipolar’ partner. Of course, I felt sympathy for her. It’s heartbreaking to read about such a tough situation, but something in the story didn’t sit right with me; the fact that she framed her partner’s illness as being linked to the abusive situation bothered me quite a bit. For my mother, symptoms of bipolar disorder had been quite obviously present for the last six years and honestly, probably before then as well. It is very difficult to watch a loved one suffer through these kinds of extremes – even when it doesn’t seem like they’re suffering. Mania looks great — full of ambition and full of energy, but when it’s gone, a devastating low arrives that can be life-changing. We like to believe that our society is moving forward, that we are removing the stigma from mental illness by supporting our anxiety-ridden teens and our depressed introverts. I’ve come to notice that our society is selectively progressive when it comes to mental illness. When words like ‘bipolar disorder’ or ‘schizophrenia’ are thrown around, reactions change. “You can make it through” turns into “I’m sorry to hear.” Diagnosis can lead to the response: “I’m not crazy”—my mother included. Of course you’re not. I would never think of my mom as ‘crazy.’ I would think of her as a nurse, a selfless caregiver. I would think of her as a smart woman, who worked hard to give me the great opportunities I’ve been presented with. I would think of her as the life of a family party, laughter ringing out through rooms. I would think of her as my mom, who taught me to read before age four and drove me to school every morning. 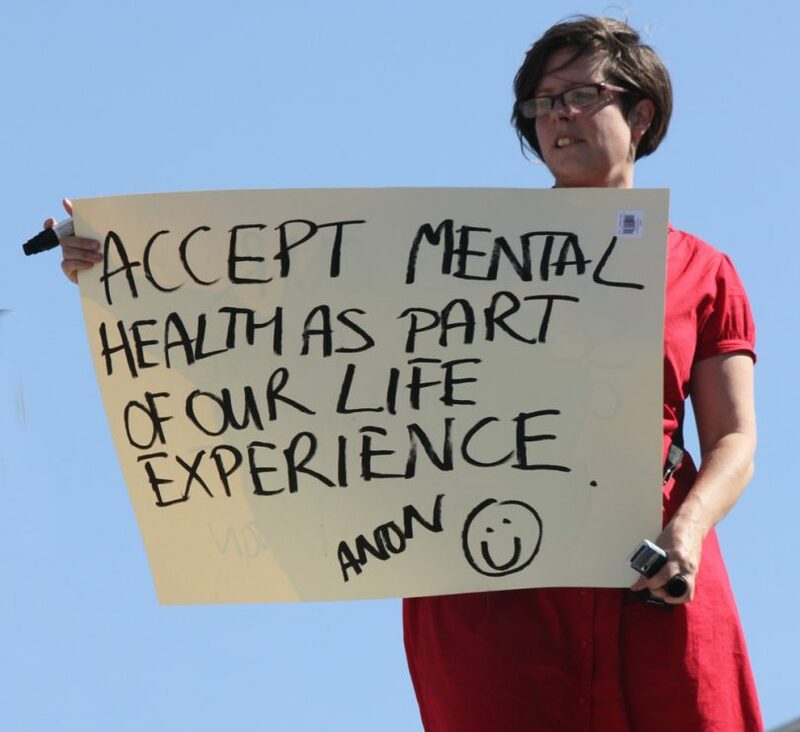 With in-patient therapy being nicknamed ‘loony bin’ or medication being nicknamed ‘happy pills’ – with both bipolar disorder and schizophrenia more likely to require these kinds of treatments, rather than simply therapy – it’s no wonder why people often choose to ignore a diagnosis. Language like this dehumanizes people with mental illness. With in-patient therapy being nicknamed ‘loony bin’ or medication being nicknamed ‘happy pills’ — with both bipolar disorder and schizophrenia more likely to require these kinds of treatments, rather than simply therapy — it’s no wonder why people often choose to ignore a diagnosis. Stigma not only causes people to talk less about mental illness, therefore reducing general education on the topic, but it causes harm to the people suffering with mental illness. The National Institute for Mental Health states, “Research shows that mental illnesses are common in the United States, affecting tens of millions of people each year. Estimates suggest that only half of people with mental illnesses receive treatment.” People living with mental illnesses refuse treatment because of a certain shame that comes with having one, especially when it comes to less common mental illnesses—and most of it comes from how we talk about mental illness. Language like this dehumanizes people with mental illness. Mental Health America suggests using person-centered language. So, instead of using the terms ‘schizophrenic’ or ‘bipolar,’ say the phrase ‘a person living with schizophrenia’ or ‘a person living with bipolar disorder.’ After all, it is people that we’re talking about. Above everything, think of the golden rule: treat others the way you would want to be treated. Language is flawed. I believe there are some words that should have no place in our society any longer. I can confidently say we throw the word ‘crazy’ around casually. In fact, I keyword searched ‘crazy’ in all of my text messages within the last year and I used it on 20 separate occasions in conversation with my boyfriend alone. ‘Crazy’ is defined as mentally deranged, especially as manifested in a wild or aggressive way. Synonyms to ‘crazy’ are ‘lunatic,’ ‘loony’ and ‘insane.’ These words aren’t kind. These words have vague definitions that contribute nothing to our language. There are better words to be said. There are words that more accurately articulate what we’re trying to say — and it’s on us to start using them.